For many manufacturers, traceability is a major concern. Being able to trace parts by their specific batch number can help to identify exactly when and where problems in the manufacturing process are occurring—as well as helping with product recalls down the line. For example, if one batch of flywheels had a problem with the quality of the steel used to make them, and were thus prone to breakage, being able to trace these parts could let the manufacturer narrow down their recall to that specific batch of flywheels. Or, say that a manufacturer were to put otherwise identical parts through different finishing processes based on the intended application. In this case, the manufacturer would need a means of reliably identifying the batch of parts to avoid shipping these parts to the wrong customers. One way to increase traceability is to use custom wire baskets to organize parts. This way, each load of parts can be easily recognized to prevent accidental mix-ups. Recently, a manufacturer that refurbished goods reached out to Marlin Steel for a custom wire basket to use for organizing their parts and holding them through their parts cleaning process. The manufacturer’s major goal was to “track parts from an entity through our cleaning procedure so the parts that are cleaned from that entity are installed back on the same entity that they were removed from in the first place. This will allow us to track issues with each individual entity through our shop.” In other words, they needed to be able to trace any issues back to their source after cleaning the parts—partly to make sure the right parts were going back to the right equipment and partly to diagnose other issues the equipment might have. So, Marlin’s engineering team whipped up a custom wire basket design for the client’s application. The client needed to save floor space by stacking the baskets in between uses and while the contents were drying. 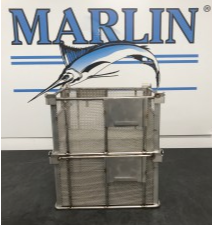 To achieve the client’s goals, Marlin’s engineering team created a custom stainless steel wire basket design that would be stackable and had a large sheet metal plate attached to one side. The sheet metal plate had a small hook which would allow the client to attach a small placard with an ID code on it. With these removable placards, the client could easily track which equipment the parts inside went to, ensuring traceability for every part they processed. The use of stainless steel wires for the custom parts washing baskets helped to ensure that they would be extra-durable. Grade 304 stainless steel was more than resistant enough to the client’s washing process—proof against both the temperatures and the chemicals involved. A fine wire mesh was used to keep the smallest parts from falling out of the basket, while larger wires were used to reinforce the frame and keep heavier parts from damaging the basket. The interior of the basket was kept free of dividers or specialized wire forms so it could accommodate almost any size or shape of part that the client would process. A side benefit of using fine wire mesh was that it did not interfere with the client’s aqueous wash process. Additionally, it allowed air to flow freely through the basket, facilitating faster drying times. Each basket had a specially-shaped top and bottom to make them easy to stack—which helped the client save space on their factory floor when the baskets weren’t in use or when parts were being air-dried. Large handholds were built into the sides of the frames to make the baskets easy to carry without consuming additional space. Once completed, the designs were put through a virtual physics simulation software for testing. If there were any issues with the design, the software would generate a report and the design team would tweak the basket design to correct the problem. Only after the design was able to clear Marlin’s rigorous testing standards were any custom wire baskets for organizing parts built. The great thing about using virtual testing was that it massively sped up the iterative design process—instead of having to wait weeks or months for physical prototype testing, the wait was mere minutes. By taking advantage of this, Marlin was able to complete the client’s custom wire baskets in days rather than months. Need a custom wire basket for your manufacturing application ASAP? Reach out to the masters of delivering “Quality, Engineered Quick®” at Marlin Steel!